The secret weapon in the fight against cancer could be millions of years old, according to new research by Northwestern scientists. Researchers discovered that specific molecules trigger a mechanism, called suicide RNA molecules, hidden in every cell that causes it to commit suicide. Not only do the RNA suicide molecules prevent cancer cells from becoming resistant to them, but they also eliminate multiple genes that cancer cells need to survive. 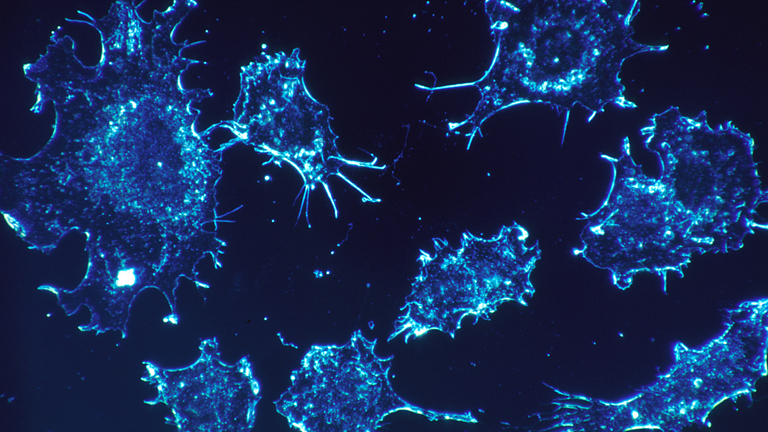 Researchers say the inability of cancer cells to develop resistance to the molecules is a first. Peter and his team spent eight years searching for the molecules, which trigger what they believe to be an ancient kill switch in cells to prevent cancer. Scientists made the discovery by testing a specific class of small RNAs that scientists use to suppress gene activity. They discovered that not only did many of these small RNAs suppress the gene they were designed against, but they also killed all cancer cells. Researchers also discovered these special sequences can be found throughout the human genome, embedded in multiple genes. These RNA suicide molecules trigger a mechanism called “death by induced survival gene elimination,” which, if activated, they hypothesized, might eliminate cancer cells with little to no effect on normal cells. To test this, researchers delivered the RNA suicide molecules to mice with human ovarian cancer. The results revealed reduced tumor growth with no toxicity to the treated mice, and tumors didn’t develop resistance to this type of cancer treatment. Researchers are now refining the treatment to increase its efficacy. He says he's long been frustrated with the lack of progress in the treatment in solid cancers, such as brain and lung cancers. He also believes cancer scientists should focus more on nature, saying immune therapy has been a success because it’s aimed at activating an anticancer mechanism developed by evolution. “The problem is cancer cells are so diverse that even though the drugs, designed to target single cancer driving genes, often initially are effective, they eventually stop working and patients succumb to the disease,” Peter said. Sept. 15: University of Chicago researchers have discovered that lymphatic vessels, which are often blamed for enabling cancer to spread, can also boost a type of cancer treatment. Dec. 13, 2016: A new study offers a possible look at the future of fighting cancer and other diseases that suppress the immune system.